This item ships directly from the manufacturer. Please allow 6-7 weeks for delivery. Select items will have additional shipping charges, please see above for this item's additional shipping charge. BEST ANSWER: Yes totally! But handle with care, they can break very easily - that said, they are my favorite wine glass. I have never put them in the dishwasher. I like these glasses very much, so I wash them by hand. Probably are but being thin and tall as they are just take a little time hand washing them. These glasses are awsome. Enjoy! Can I have each glass personalized? 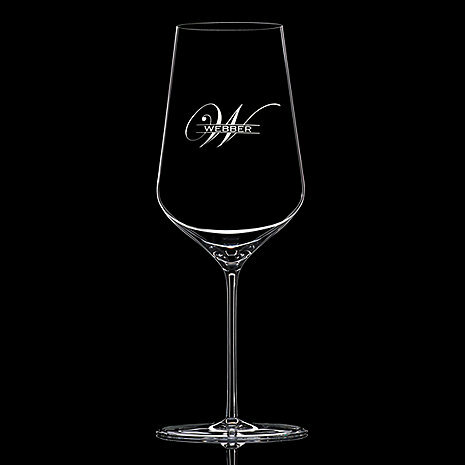 BEST ANSWER: Hello Chuck, typically the set of two is sold with the same personalization on each glass. However we do offer custom personalization depending on our ability to pull off your request. Please reach out at 800-356-8466 and our sales department will be able to assist you with any custom personalization needs. Thank you! Love these glasses! Thin, long stem and beautiful. Love the shape too. Great cab glass. I higly recommend! Ordered these personalized for my son for Christmas and wished I had ordered myself a set. Beautiful and elegant. Plus the breakage guarantee is an added benefit. They are light and easy to drink from! The inscribing was done at a high quality and we like it. Not really happy with the height of the glasses just a little too tall.